The Can Am Commander has been a trailblazer since the day it was released, both figuratively and literally. It can absolutely blow through the trails and it also set the tone for combination utility and recreational vehicles. At Side By Side Sports we carry all of the Can Am Commander accessories you need to deck out your UTV. No matter what you need we are happy to help. We have everything for your Commander from Lift Kits, exhaust, fuel controllers, to clutching and tire packages. One of the most popular accessories for the Commander are doors and we have those as well. Most items that fit the Commander 1000 fit the Commander 800 as well and if you ever have any question on fitment please contact Can Am Commander specialists. 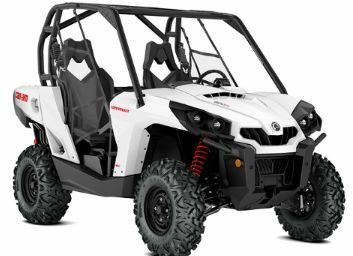 Side By Side Sports is in no way affiliated with Can-Am (Bombardier Recreational Products Inc.) All of their company and product names are trademarked, any use of their name is only to identify their vehicles as it pertains to the parts and accessories we sell.